We are excited to launch a frequently requested addition to our hospital cubicle curtain track line. We are now offering our curtain track in a convenient kit form. It is the same hardware at the same price, just in a convenient kit for ease of ordering. This allows you to order the layout you need and be sure you get all the parts and pieces necessary without having to spend a couple hours looking over the hardware to determine what you need. These kits are designed for a standard flat ceiling and can be used as they are; or you can cut them down for custom sizes and layouts that fit your personal needs. You can also order additional hardware to further customize your kit to easily attach to grid ceilings (acoustic ceilings) or to suspend your track down from the ceiling on suspension tubes. 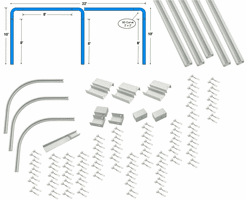 Exact details on what you would need to add to a kit for grid ceilings and suspended track systems are within the description of each kit. "These kits are for your convenience ". For a lot of people one of the standard kits we offer are exactly what they need, others need to change them up a little bit. We do it your way. Just call our Toll Free Number and let one of our customer service professionals get you exactly what you want. You can say "I want a SQ2020 kit but I only need half that many carriers because my curtains will have 12" grommet spacing"....no problem. We will subtract the correct amount from the kit price and everyone is happy. We can modify these kits any way that you need, they are just a good starting point. If none of the kits is even close to what you need you can fax or email us over a rough drawing of the layout you want with the dimensions on it. We will get you a custom quote today, usually right while you are on the phone with us.